Whether your child is heading to camp for the first or 10th time, prepare like a pro. If your child is ready for overnight camp this year and is going to be spending the summer making new friends in the great outdoors, it’s time to prepare and plan for packing. A great way to get acquainted with what your kids will need at camp is to visit the camp prior to your child’s stay. YMCA camps invite you to come to an open house so you can see what camp will be like for your child. According to Kurt Simer, BOLD & GOLD program director, it’s a good idea to start the packing process a few months before camp (e.g., in the spring for summer camp). 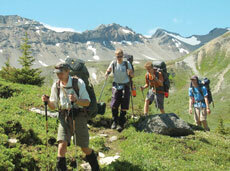 “It’s not necessary to go out and buy expensive clothes and gear for camp, where things tend to get dirty,” says Kurt. If your child needs new sandals or boots for their upcoming camping experience, have them wear the shoes prior to getting to camp so that they are broken in, and new-shoe blisters can be avoided. You can also help your child with the unpacking process by grouping outfits or camp experience gear together. For example, you can use gallon-size plastic bags for whole outfits, or you can group items that will be needed for different parts of camp—while at camp, while on a canoe, etc.